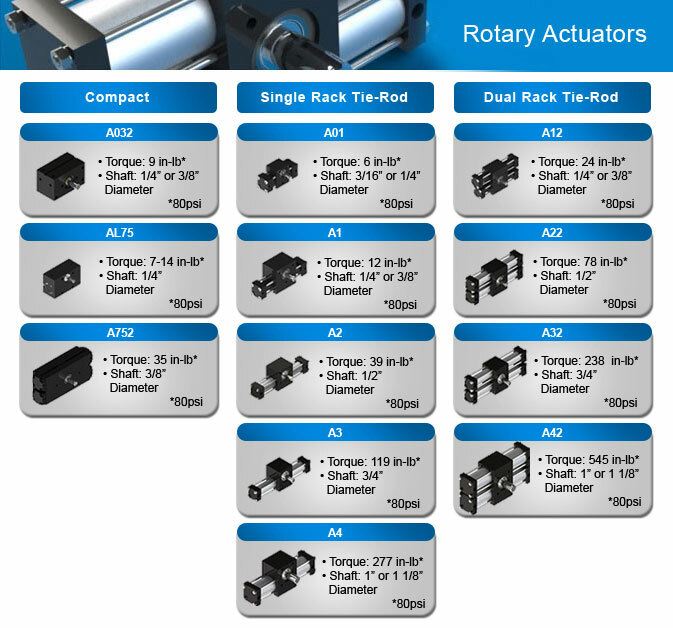 Rotary Actuators | Rotomation, Inc.
our engineers can help you determine the best solution for your application. Any modification or special features you need, including the development of a new product. We also supply a wide range of accessories to enhance our actuators' functionality and improve load adaptability. 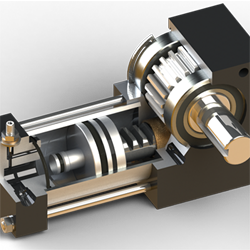 At Rotomation, we manufacture high-speed, heavy-duty pneumatic and low-pressure hydraulic rotary actuators with various shaft motions. Our design and engineering team will get you the product that fits your requirements. Choose rotation options from bidirectional rotation between two, three, four, or five positions, and unidirectional rotation in steps. 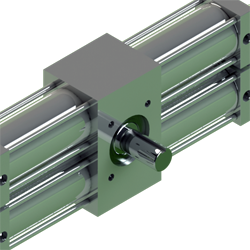 Each rotary motion can be combined with linear motion in a single, independently-controlled actuator. Our actuators are used in applications for metalworking, assembly, testing, and packaging machinery for automotive, semiconductor, food, pharmaceutical, and other industries. Their customization and configurability means you can specify an actuator that will optimize the design of your machines. Bidirectional rotation between two positions, like a windshield wiper. 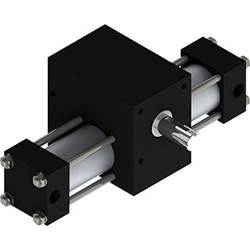 Our mini, or compact, rotary actuators are designed for applications where space is of the essence and torque is as important. 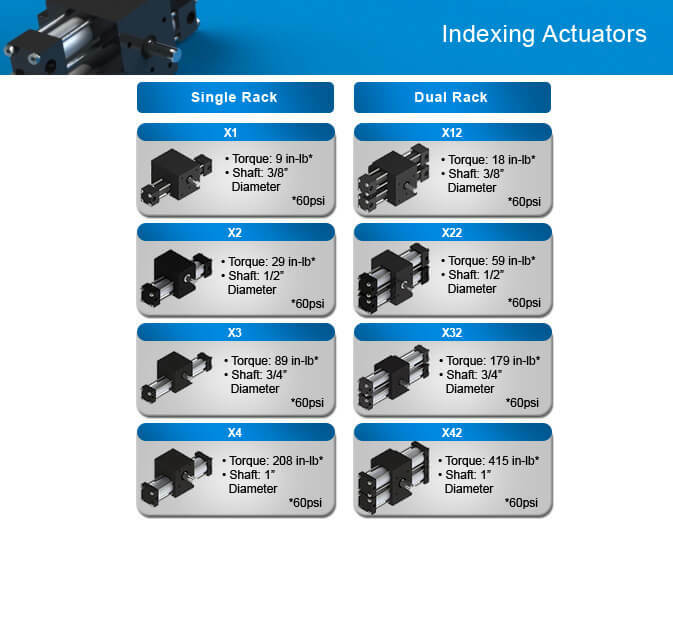 Indexing actuators provide unidirectional rotation in fixed precise steps to hard stops. They prevent backward rotation and feature no accumulating error. Single or dual rack indexers available. 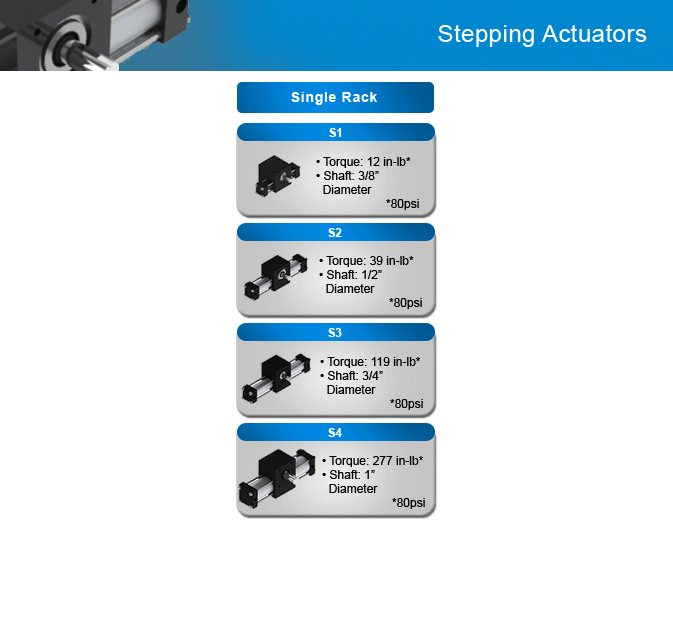 Stepping actuators provide unidirectional rotation in steps, like indexing actuators, but without the hard stops. 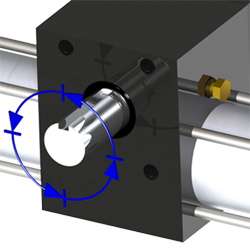 These actuators also prevent backward rotation but incur an accumulating error. 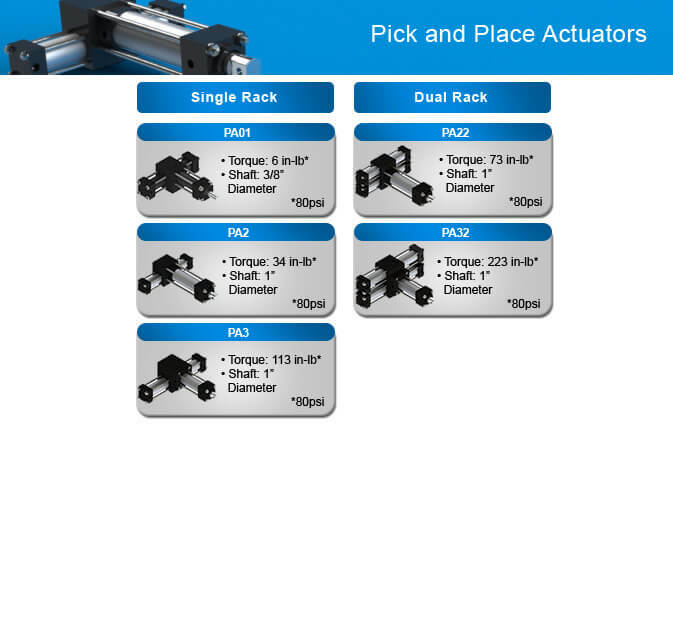 Pick & place actuators combine a rotary section with a linear cylinder to provide independently-controlled linear and rotary motion. 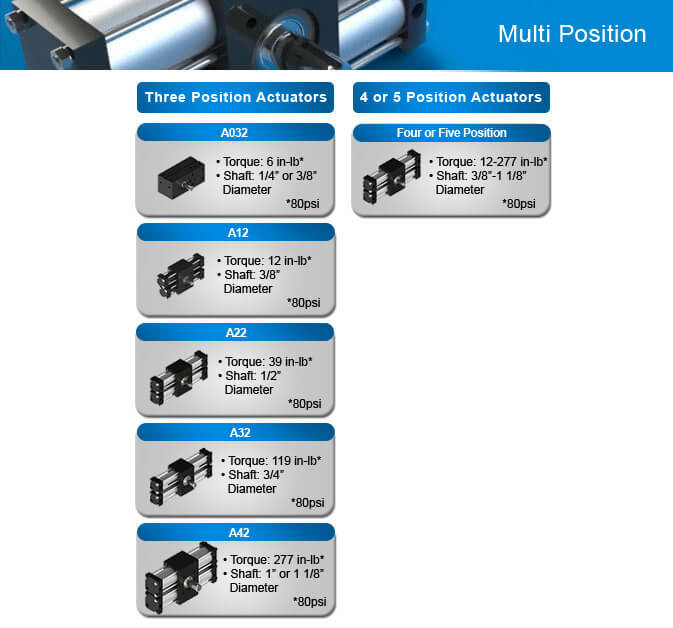 As multi-motion actuators, they can also provide stepping motion. 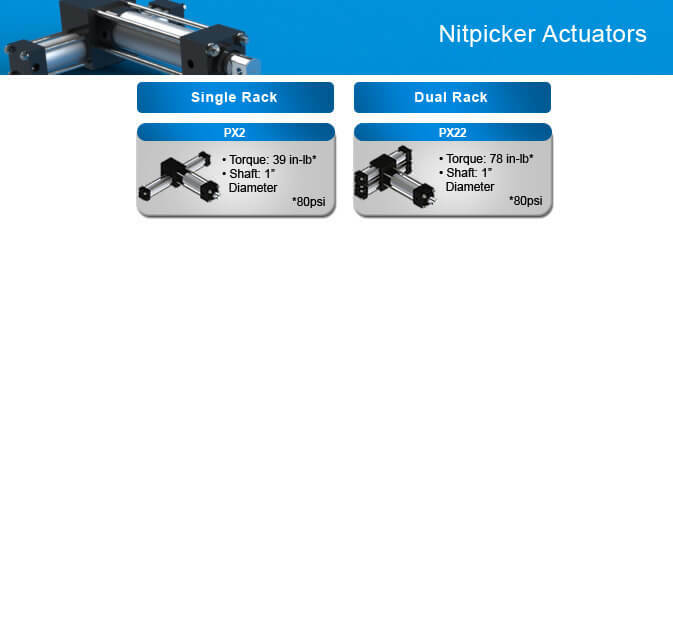 Nitpicker actuators provide independently-controlled combined indexing (unidirectional rotation in fixed steps to hard stops) rotation with linear motion. No backward rotation or accumulating error. No actuators like these elsewhere. Patented designs & unmatched performance - it's what sets us apart. Need help sizing a rotary actuator for your application or with your order? We design actuators that fit your needs. Customize one or chose one of billions of standard configurations. See how cam drives, servo based, and pneumatic indexing drives compare. Delivering engineered solutions since 1967, Rotomation is dedicated to providing reliable, extremely configurable, and fully rebuildable pneumatic actuators for automation. Custom and special actuators are our specialty.